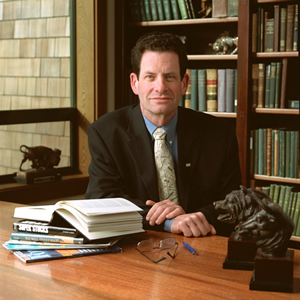 Ken Fisher is one of the world's leading financial advisers. Fisher Investments-the global money management firm he founded less than a decade after graduating from HSU-manages tens of billions of dollars for prominent global institutions and affluent individuals. His success has landed him on the Forbes 400 Richest Americans list. Ken Fisher regularly appears in the financial media and widely recognized as a financial guru. In 2011, he ranked in the top 5 most accurate market forecasters on CXO Advisory Group's Guru Grades* list. In 2010, he was named to Investment Advisor's 30 for 30** list-recognizing him as one of the most influential investment advisors in the previous 30 years. Beyond serving as Fisher Investments' CEO, Ken Fisher is a prolific author. His "Portfolio Strategy" column has run in Forbes magazine since 1984-making him thefourth longest-running columnist in the magazine's over 90 year history. He has written 8 finance books, including 5 national bestsellers: The Only Three Questions that Count (originally published in 2006 and re-released in 2012), Ten Roads to Riches (2008), How to Smell a Rat (2009), Debunkery (2010) and Markets Never Forget-But People Do (2011). Ken Fisher and his wife, Sherrilyn, have three adult sons. Leader of a major company, famous author and columnist, father, husband-Ken Fisher clearly has a lot on his plate. How does he manage to stay so productive? "I relaxed once and I never want to go through that again," Fisher says with a wry smile. "When I was young," he continues on a more serious note, "I got in my bones how compound interest works. Compound interest deployed right is magic, not just in finance, but in all of life. I compound my human capital at a slightly higher annual rate than most folks do because most don't try to-and I never, ever stop compounding." *www.cxoadvisory.com/gurus. As of 5/29/2012. Fisher Investments has no affiliation with CXO Advisory Group. Ken Fisher's market forecasts in Forbes represent his personal forecasts of the overall market and are not an indication of the performance of Fisher Investments. Not all forecasts may be as accurate as those in the past. Investing in securities involves the risk of loss. Past performance is no guarantee of future results.